Companies are struggling to protect confidential information from risk of theft. It’s something no company should have to face, but ultimately, it happens to everyone at some point. The best thing to do is to learn what measures you can take to protect your confidential information. No matter what industry or business you’re in, your company will collect sensitive information from employees, customers and partners. Without focusing on how to protect this information, you may face a significant risk of identity theft or fraud. It’s important to shred any unnecessary business documents, or other media that contain sensitive information. Even government agencies have experienced intense security breaches and have faced lawsuits for not protecting their confidential information. Not handling your sensitive information properly has its consequences. Large businesses, and corporations should adhere to the strict regulations that are in place today. Breach of privacy regulations like HIPAA, FACTA and GLB can result in a corporation facing heavy fines, or even jail for its corporate officers. Most organizations believe that economical smaller office shredders are good investments, however, these methods are not efficient, nor are they secure. Small shredders do not completely destroy documents or other forms of data, and are not reliable for the disposal of sensitive information. Because of this, there are some instances where confidential information may end up sitting around in an office somewhere or dumped in a regular trash can. It’s easier than you think to protect your company from risk. It’s simply a matter of working with third-party commercial shredding services. 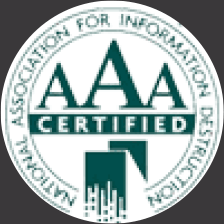 These types of services provide you with certification of destruction and the peace of mind knowing you’ve lessened your company’s liability for the breach of confidential information. It’s best to choose a partner who is NAID AAA Certified, and has state of the art mobile shredding capabilities as well. Professional shredding and destruction services are an extremely low-cost, convenient solution. There are some businesses that generate larger amounts of paper on a daily basis – for them, commercial shredding services are even more essential. When you find the right vendor for your business you will rest easy knowing you’re risk of identity theft has been significantly reduced. Whether it’s a one-time shredding service, or a regularly scheduled shred for your business, IntelliShred has the right combination of equipment, tools and staff, capable to meet your product destruction, shredding and disposal needs. We have over 30 years of experience and are leaders in the industry. Our highly-qualified team can help you adhere to privacy regulations and ensure your sensitive information is secured. We know that your protecting information is crucial to your business. Contact us today for more information on our secure, and reliable commercial shredding services. 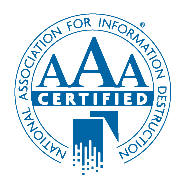 Data loss and data breaches have recently become some of the most talked about topics in the business community. This is no doubt because of the media frenzy surrounding Apple and AOL when they grappled with their own data losses. And it’s even worse for small businesses. According to the U.S. Small Business Administration, over 70% of businesses that lose client data end up shutting down within seven months. These three things combined can easily kill any business. On the other hand, hiring a document shredding company can potentially save your business from financial ruin. Not only that, but hiring a document shredding company will also improve your company and brand’s reputation. Your clients will appreciate the value you place on their privacy and confidentiality. There’s no better way to show your commitment than to hire a document shredding company. And it will ensure the safety of your clients’ information all the time. Shredding documents is the best way to ensure that no one can access your important data. In fact, analysts now argue that a professional shredding service is more important than ever for guaranteeing secure financial management. Your documents will be destroyed in our state-of-the-art shredding truck, on your property. When you opt for onsite document shredding, the documents will never leave your sight. An authorized client representative will watch the document destruction with you to ensure all the documents are destroyed. Then, the documents will be recycled into another paper product. Do I Really Need A Document Shredding Company? First, it must be said that the law requires businesses to have a data protection system in place to protect their customers and employees. Shredding is an important part of this system. For most businesses there are certain sensitive documents that need to be destroyed immediately. These documents may contain important financial info or social security numbers. On-site shredding services are the most effective and convenient way for a business to destroy documents. It also lends the business more credibility when dealing with a credible NAID certified document shredding company. And finally, remember that thieves are just as likely to target businesses as they’re to target consumers. So, consider involving a document shredding company in your overall business strategy.